Earlier in the year we had a pretty frank conversation about Pantone’s pick of Radiant Orchid as the color of the year, and I believe at that time I confessed that I’m not a huge purple fan. The exception to my purple rule, however, is deep rich eggplant. Especially this time of year! 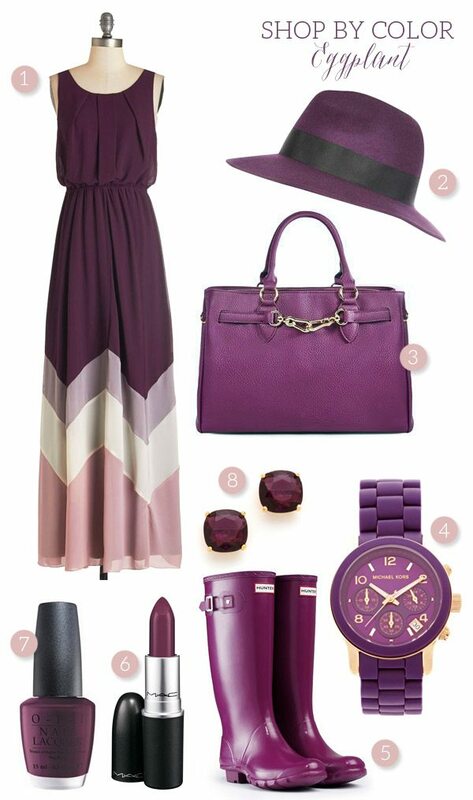 Paired with denim or rockin’ a bold lip, eggplant is just perfect for fall. Ok, I confess. There’s no way I could pull off a dark purple lip, but you’re obviously way cooler than I am and I know you can make it work. Same goes for this purple fedora. You’d look like so much better in it than I and would be the envy of my style dreams. If all else fails, you can’t go wrong with a pair of gorgeous earrings or another of these lovely eggplant accessories for fall. I am loving the look!